We look forward to talking with you about recent changes to the Maintenance of Certification (MOC) program and listening to your input at spring 2016 medical society annual meetings. American Board of Internal Medicine (ABIM) staff has already attended two conferences this year, including the Society of Critical Care Medicine’s Critical Care Congress in February and Society of Hospital Medicine (SHM)’s Hospital Medicine 2016, earlier this month. In addition to the ABIM booth in SHM’s exhibition hall, members of ABIM’s Community Engagement Team hosted small group discussions (Discovery Sessions) for physicians to share their perspectives. There was a great turnout for these community conversations and we learned a lot from those who attended. We gained important insights on how the MOC program could be more relevant to their individual practices and are excited to conduct more Discovery Sessions at future meetings. Talk with us at society exhibition halls. Since we last met with physicians at the fall meetings, there have been a number of changes to the MOC program – including the continued extension of the Practice Assessment requirement, the release of 1,000+ accredited CME activities that count for MOC credit, and the opening of the blueprint review to subspecialties. ABIM staff will be available to discuss these changes and answer questions about the program as it pertains to you. Share your thoughts on MOC in a group discussion or one-on-one session. Throughout the spring and summer, ABIM staff will facilitate a number of Discovery Sessions to speak directly with you and a small group of your physician peers. We want to hear your thoughts and how you would improve MOC to be more relevant and less burdensome. At the society meetings, we are also available for one-on-one conversations and informal meet-ups. Please join us and tell us what you want your board certification to say about you. Attend a Q&A session at the American College of Cardiology’s annual meeting. During this session in April, I will discuss recent program changes with, and address questions and concerns from, the attending cardiologists at ACC.16. Our staff will relay physician input from all the meetings back to ABIM governance, staff and leadership, so we can all continue to learn from the ideas and insights you’ve shared and use your feedback to enhance the MOC program. If you’re not attending any of these society conferences this year, we still want to hear from you. 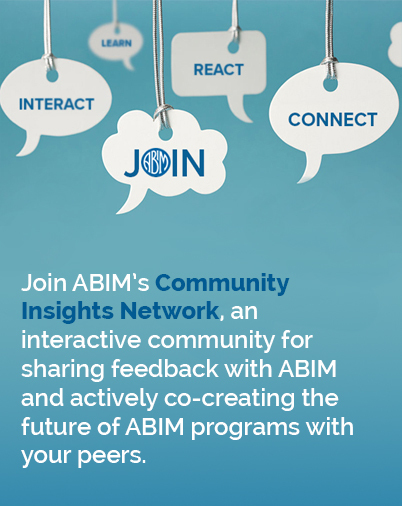 E-mail us your feedback on how you would make ABIM’s MOC program work better for physicians and what you want your board certification to say about you, and subscribe to the Transforming ABIM blog for updates on other ways you can participate.